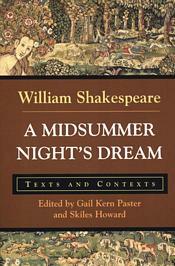 This edition of Shakespeare’s A Midsummer Night’s Dream reprints the Bevington edition of the play accompanied by four sets of primary documents and illustrations thematically arranged to offer a richly textured understanding of early modern culture and Shakespeare’s work within that culture. The texts, including facsimiles of period documents, conduct literature, county records, reports of court entertainments, and Queen Elizabeth’s speeches, contextualize the play’s treatment of popular and royal festivity, communities of women (including Amazons, gossips, and nuns), marriage expectations, and the supernatural. Editorial features designed to help students read the play in light of the historical documents include an intelligent and engaging general introduction, an introduction to each thematic group of documents, thorough headnotes and glosses for the primary documents (presented in modern spelling), and an extensive bibliography.